Maple Butter. Product of Ontario. Pure 100% Maple Butter A delisious butter for toast, muffins or bagels. A great frosting or topping for you favourite dessert. 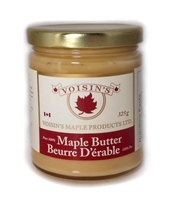 Voisin's Maple Products, Ltd. The Honey Bee Store: Honey and Maple products.